Stabilize your Big-Bag shipments, Secure your transports, Optimize your costs. BIG BAGs are flexible containers, most often made of woven polypropylene. It is an intermediate solution between bag and bulk containers for the transport and storage of products in powder form. The BIG BAG fabric is laminated or bare; its woven polypropylene structure is very slippery making the BIG BAG unstable. BIG BAGs exist in various formats: flat bottom, pyjama bottom, fix-lock with or without discharge spout…an empty BIG BAG is rather compact when folded. powders or granulates have high flow characteristics which may cause flexible BIG BAG containers to sag. the BIG BAG's fabric is laminated or bare; its woven polypropylene structure is very slippery making the BIG BAG unstable. The BIG BAG's ability to deform can rapidly result in it slipping off the pallet, or even worse, off the truck. BIG BAGs are highly sensitive to defects on truck beds or wooden pallets. CGP COATING INNOVATION, specialist in anti-slip coatings, proposes a complete line of innovative packaging solutions designed to address the instability of all types of BIG BAG packaging. 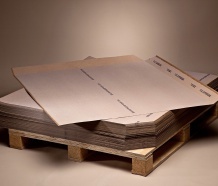 Our anti-slip load stabilization sheets of the LOGISTICS range have a reinforced coefficient of friction. The STABULON®, STABUSTOP®, STABUMAX®, BASIC BOARD® and ECOLOGISTIK® anti-slip tie-sheets are specially adapted to flexible containers. Secure your transports by preventing BIG BAGs from sliding off the pallet, or even worse, out of the truck. Thanks to their waterproof properties, to prevent rising damp from uncoated fabric BIG BAGs. 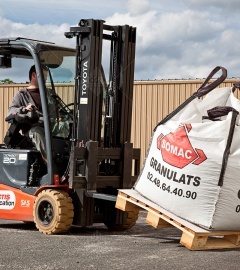 to prevent deformation, by maintaining the BIG BAG stable on the pallet or truck. Perform handling operations up to 2 tons. Facilitate the transport of highly volatile powders. Use small-volume and lightweight packaging allowing you to optimize warehousing space.